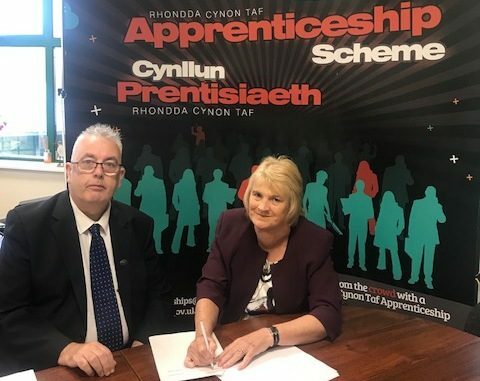 Rhondda Cynon Taf Council leaders have formally signed up to UNISON’s Apprenticeship Charter, committing to better rights for workers. The trade union developed the charter to protect workers from employment abuses. Quality apprenticeships can be the way out of unemployment for people both younger and older and a step forward in protecting apprentices at work, not just cheap labour. UNISON’s charter highlights well funded, high quality apprenticeships leading to a meaningful job, making an important contribution in addressing skills gaps and tackle unemployment. It also calls for apprenticeships to be developed jointly by employers, trade unions, training providers, and apprentices. Under the charter, the council has pledged to do everything it possibly can to grant apprentices rights to an employment contract and a job offer once their apprenticeship is complete. The council, has also committed to conducting a skills audit, to determine needs and meet regularly with apprentices and their representatives. “This is a proud day for both our UNISON members and Rhondda Cynon Taf County Borough Council. We have been working with the council for a number of years now on the apprenticeship scheme. Even through the worst times of austerity the council has tried to commit to keeping an apprenticeship scheme running.